David Haye’s manager Adam Booth has today confirmed it is now up to the Wladimir Klitschko camp to agree to their latest offer. Previously the negotiations had hit a stumbling block after the WBA champ wanted more than 50% knowing that he would bring more of audience than Klitchsko. However, now all the previous disagreements have been ironed out, Adam Booth and David Haye were happy to offer Klitschko a 50-50 split. This was a deal that the Ukrainian had wanted from day one, Wlad had set a deadline of January 4th to agree to fight and now it’s all up to the WBO and IBF Champ to accept. 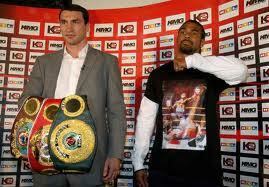 “We are now perfectly positioned to get together and make this fight with Wladimir Klitschko,” said Booth. “We have sorted out all the old problems and disagreements and are ready to sign the deal both (Klitschko’s manager) Bernd Boente and I discussed on Sky Sports’ Ringside show in November. Speaking on UK television about the money that the Haye camp generates, he added; “Despite the fact we know we bring more UK television money to the table, David and I are happy to split the entire pot 50:50 and grant Wladimir the deal he has wanted since day one. 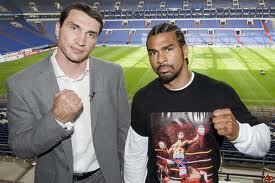 David Haye said that he sees no reason why Klitschko should not agree to a unification fight in 2011. 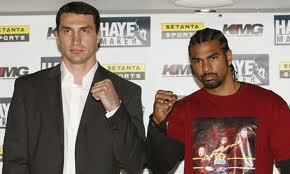 “We have now ticked every box they have asked us to tick and I just hope Wladimir is as eager to fight as he tells everyone he is,” said Haye. Wladimir Klitschko has pulled out of the schedule fight against Dereck Chrisora this Saturday; the Ukrainian has a back problem and has withdrawn just three days before the fight. Wladimir Klitschko is expecting a stern test when he takes on Dereck Chisora for his IBF & WBO Heavyweight Championship titles, but he insists that he will control the fight from the start at SAP Arena in Germany this Saturday. The Ukrainian is under no illusion of the threat that Chisora possess and also suggests it will be his most dangerous opponent so far, Klitschko has even insisted that the Zimbabwean-born fighter is more of a threat that David Haye. However, having done all the hard work in the gym, the champion is confident that he can see off the 26-year-old and retain his world titles. “I feel fantastic. I’m looking forward to this fight and I think that Dereck Chisora showed also that he is ready, physically and mentally,” said Klitschko. He added: “I analyse my challengers very precisely, inside out. And I’ve been watching Dereck Chisora a lot before. Chisora has always suggested that he has the power to knock Klitschko out, and the champion is realistic when asked if he could fall victim to a major upset. “There’s been a lot of talking. Any heavyweight can hit and any heavyweight can get knocked out,” the Ukrainian said. “It’s (happened throughout) history a lot of times, especially with these young challengers that are undefeated. 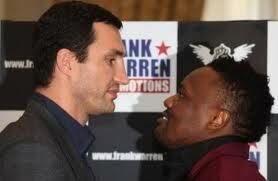 “For example, Leon Spinks beat Mohammad Ali in the past, so that’s why I’m not going to underestimate Dereck Chisora.